The actor: Although Barry Corbin started out doing Shakespeare, he spent the ’70s and ’80s playing sheriffs, military men, and various other authority figures, delivering a hint of humor and more than a hint of gruff intimidation along with his Southern drawl. A staple of film (Stir Crazy, WarGames, No Country For Old Men) and television (Northern Exposure, Lonesome Dove, The Closer), Corbin can currently be seen as part of Charlie Sheen’s therapy group on FX’s Anger Management. 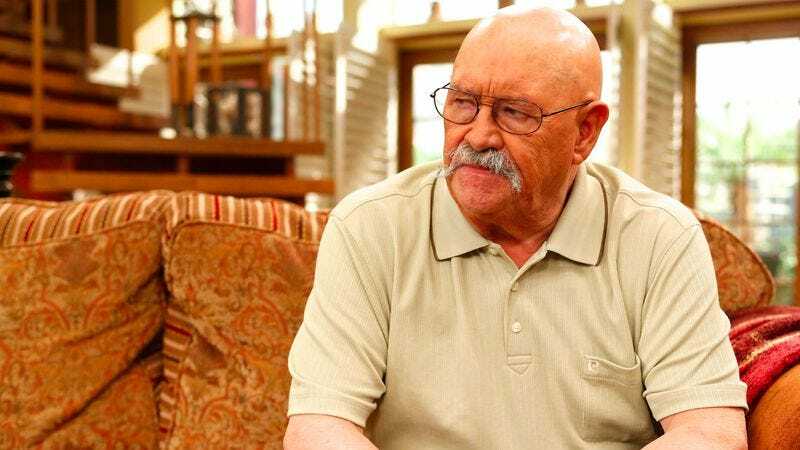 Barry Corbin: Well, it’s a fun character. He doesn’t like anybody. He’s a Vietnam vet who’s… he’s not angry at any particular group. He’s angry at everybody. [Laughs.] They just called me and sent me the script and asked me to do it. It looked like a fun deal, so we did 10 episodes at first, and now we’re waiting for them to air those, and we’ll see where it goes. The A.V. Club: You worked with executive producer Bruce Helford on The Drew Carey Show. Was that how you found your way into the mix for consideration? AVC: It’s certainly the talk of the town just by virtue of being Charlie Sheen’s show. How has he been to work with? BC: Oh, he’s just wonderful. He’s terrific. He’s funny and very generous, very helpful. I like him a lot. AVC: Bruce Helford has a history of taking shows that revolve around a lead and building them into strong ensemble comedies. Has the Anger Management cast begun to gel? AVC: It must’ve been nice to pull this role, though. It sounds like it’s a regular gig. BC: Oh yeah, well, I haven’t made a deal with ’em yet. I just sign a contract each show. We’ll see where it leads from there. I don’t know. BC: Oh yeah, that was in New Orleans. We made a deal where I would go down there… I wasn’t full-time, so I’d go down there for maybe a couple of weeks, do a few episodes, then go home for a week or two. So I was kind of commuting back and forth between Fort Worth and New Orleans. But they put me in the Presidential Suite at the Bourbon Orleans Hotel, so I really felt like I was being catered to. [Laughs.] It was a lot of fun. That was a nice little series. We lasted a couple of seasons. BC: I guess they saw every old man in the world for that part. [Laughs.] All these old actors come up to me and say, “You stole my part!” They never saw me for it, though. They called me about a month before I was supposed to shoot and asked me if I wanted to do it. My manager called me and said, “You may not want to do this—it’s just one scene—but it’s the Coen brothers, and the scene is with Tommy Lee [Jones].” I said, “Well, I know Tommy Lee.” I said, “Send me the script.” I started reading the script, I got most of the way through it, and I started thinking, “Well, where in the world is this Ellis character?” Then I got to that scene, read it, and said, “Whoa, wait a minute!” I went back and read it again, and I didn’t even finish the script. I called my manager up and said, “Sure I’ll take that part! That scene’s the movie!” [Laughs.] So that’s how I ended up doing it. AVC: You also worked with Tommy Lee Jones in In The Valley Of Elah, which came out the same year. Which did you actually film first? BC: I think In The Valley Of Elah was after. But I’d worked with him way back when on Stranger On My Land. That was the first time I met him. AVC: If you’ve worked with him this many times, you must get along with him pretty well. BC: Well, I never had any trouble with him, anyway. [Laughs.] We always had a really good working relationship. BC: The Hot Spot, that was with Don Johnson. And directed by Dennis Hopper. We shot that down in Austin, and it was a good experience as far as I was concerned. I really enjoyed it. Y’know, I wasn’t in it that much. I was only there for about a week, I think. But it was great fun to do. AVC: How was Dennis Hopper as a director? AVC: Do you have any idea how many times you’ve played a sheriff over the years? AVC: Any Kenny Rogers anecdotes from Six Pack? BC: [Laughs.] Well, no, not offhand. ’Cept that he said, “Boy, this is easy! I wish I’d known how easy this was. I’d’ve taken up acting a long time ago!” But that was the first time I worked with Diane Lane. That was the last movie she played as a kid, but we became friends later. I haven’t seen her in a while, but she’s married to Josh Brolin, and I see ’em occasionally at functions and so forth. I know a lot of people like that movie. I’m surprised at the number of young people who’ve seen it, ’cause it’s a pretty old movie. BC: Now, I’ve played a lot of military men, but I’ve only been a general twice. Once was in WarGames, and the other time was in a thing called Solo. AVC: With Mario Van Peebles. BC: That’s right. That was great. I shot that down in Mexico. I’m not sure I want to go shoot in Mexico right now, but back then, it was fine. [Laughs.] We were at… maybe Cabo San Lucas? I’m not exactly sure where we shot that at, but we flew down, stayed at a nice resort, and then went out to a small town and converted a movie theater into the interior of the ship where I did all my stuff. It was good. Mario Van Peebles was very gracious and nice. I enjoyed the whole experience. BC: That was an Earl Hamner piece. Earl developed it. I was not interested in doing a series at that time, ’cause I was doing a lot of movies, a lot of feature films. They called me and asked me about it, and I said, “Well, I don’t want to do it. I don’t really want to do a series.” So the next thing I know, there’s a call, and it’s Earl Hamner—you know, the narrator of The Waltons—and I hear his voice: “You’ve got to do this series. We need you in this series.” And I was captivated. [Laughs.] And I said, “All right, let me read it.” So I read it, and it was kind of a fictionalization of the birth of rock ’n’ roll, with the character of Boone kind of like a young Elvis, and I played his father, who ran a service station and was a mechanic. It was a nice series. It didn’t last a whole long time. [Laughs.] But it was nice while it did. BC: Oh yeah, that was a lot of fun. We shot that in maximum security in Florence, Arizona, in the Arizona State Prison, and all the extras were actual prisoners. [Laughs.] So it was kind of interesting to watch the interaction between. Richard Pryor was nervous every time they’d bring us in, ’cause we had to go through three different gates, and they had to slam one gate shut and then open another one. Then we got in there, and Richard was quiet and didn’t say anything. He’d just sit in a corner and watch. But Gene Wilder would be out there playing basketball with these murderers and people, all of ’em playin’ tough. BC: I got that script, and I asked my son, who at the time was about 9 or 10, I guess, “What do you think about me doing Critters 2?” ’Cause he’d seen the first Critters, and [M.] Emmet Walsh played the sheriff in that one, but he was doing something and couldn’t do it in this one. So he said, “What do you do in it?” I said, “I play the sheriff.” He said, “You don’t get killed, do you?” I said, “No.” He said, “Take it! Take it!” So that’s the way I came to do that movie. [Laughs.] Because my son said, “Take it!” I really enjoyed it. A guy named Mick Garris directed, and it was a lot of fun. We shot mostly at night, which is not my favorite thing, but it’s okay. AVC: Do you remember how that came about? BC: Yeah! Whitey Durham! That came about real quick, too. I’d never watched a basketball game in my life, and they called me from California and asked me to come out and test for this part. I guess they’d seen a lot of people out there, and they didn’t find anybody they wanted to use, so I flew out to California and tested for the part. And they had me wait in the other room, and they came out in a few minutes and said, “Can you be in North Carolina next week?” And I said, “Sure I can!” So I flew back home, and it was basketball season at the time, so I watched a couple of basketball games and watched some of these coaches and how they behave. Then I got out to North Carolina. Well, the guy who was really handling and staging all the games, this real coach, said, “Would you like to come watch us run some plays?” I said, “No, not particularly.” He said, “Well, if you don’t watch us run plays, you’re not gonna know what’s happening.” I said, “I’m not gonna know what’s happening anyway. All I’ve got to do is look like I know what’s happening.” [Laughs.] I mean, you don’t have to learn how to fly a plane to play an airplane pilot. He said, “Oh, okay,” and I guess he finally decided that I was doing okay, ’cause he said I was the best TV coach he’d ever had. AVC: For someone who didn’t know anything about basketball, you had a nice long run on the show. BC: Oh, yeah! I read that book, Lonesome Dove, and I told my agent that they were gonna make a miniseries out of it and I wanted to be in it. I didn’t care what part. I just wanted to be a part of it. And they forgot. [Laughs.] When they were casting, the people casting it weren’t taking submissions. They came to California and were calling specific people to come in and audition for parts. And they called my agent and asked me to come in and audition for Roscoe, and I did, and I guess they liked me, ’cause they hired me. And that’s the way that came about. But it was one that I really wanted to do. I’d’ve done anything to be a part of that show. AVC: You obviously have no aversion to Westerns. BC: I love Westerns! [Laughs.] Conagher was interesting because they hired me to play a stagecoach driver. So I went out to Colorado on location to where they were, maybe about three or four days before I had to shoot, and the stunt coordinator said, “Do you drive a six-up?” I said, “The most I’ve ever driven is a two.” He said, “Well, you’re driving a six-up on this one, because we don’t have a place for a line driver in the coach.” So I said, “Oh, okay, well, we’d better practice a little bit, then!” So I spent three days in a crash course of driving six horses. And every time you see me driving that coach, it’s me. AVC: You’ve got quite a history with riding horses as well. AVC: You’ve done some rodeos for charity in the past. Do you still do that every once in a while? BC: No, I haven’t done that in a while. I’m not saying I won’t do it. I might again. I don’t have any horses right now. My old cotton horse died about two years ago, and I got rid of the rest of ’em. I just gave ’em to children’s riding programs. So I don’t have any horses now. I don’t have a place for any. AVC: In addition to working with Sam Elliott again on Conagher, you also worked with Tom Selleck on a couple of Westerns, too. AVC: How much sheep-shearing experience did you have going into The Thorn Birds? BC: I didn’t have a bit. I probably sheared about a hundred sheep to do that one scene, though. [Laughs.] Just shearing sheep and doing my monologue. I had to shear a lot of sheep to get to where I was comfortable doing that. AVC: Given the ratings, that must’ve been a pretty high-profile gig for you at the time. BC: Well, it was. You know, at that time, miniseries were a big deal. They don’t make ’em anymore, but at that time, they had those big, high-profile deals. Barbara Stanwyck and Richard Chamberlain and Jean Simmons and Chris Plummer—all those people were in it. So it was a pretty good deal. AVC: In the early ’80s, there were a couple of occasions where you worked with a particular actor once, then ended up in their next project. For instance, you played Fat Zack in Any Which Way You Can. Then you’re Arnspriger in Honkytonk Man. BC: Yeah, I believe Clint [Eastwood] asked for me for Honkytonk Man. I think, anyway. He wasn’t aware of me before Any Which Way You Can, I don’t believe. I just went in for a casting call on that, and they hired me to do it. I just worked, as a matter of fact, with his daughter, Alison Eastwood, on a little project in Alabama. I hadn’t seen her in quite a while. We’d worked together in Nevada doing a movie a few years ago, but she reminded me that she’d met me when I was doing Any Which Way You Can up in Jackson Hole, Wyoming. She was just a tiny little girl. And when she said that, I did kind of remember her from that time. AVC: Was doing The Man Who Loved Women a similar case, where Burt Reynolds asked for you after doing The Best Little Whorehouse in Texas with you? BC: No, I don’t think so. I think it just happened that way. We did Best Little Whorehouse In Texas, then when Blake Edwards was casting The Man Who Loved Women, he asked me to come in and read for it, and I went in and he cast me. And then when we went in to do the actual shooting at… I think it was over at Fox, and I had all the lines down, because I knew Blake had written the script, and I figured he’d want me to say the lines the way he wrote ’em. But he said, “No, no, just throw that away. I write that stuff for the suits. Don’t worry about it. Let’s just have some fun.” So we just improvised. I mean, it was a lot of fun, but most of it was improvisation. AVC: Did you get to sing in Best Little Whorehouse? AVC: When you did your one-off episode of The Duck Factory, did you get to work with Jim Carrey? BC: I did. Not only that, but I got to knock Jim Carrey out. [Laughs.] He reminded me of that, as a matter of fact, several years later. AVC: Do you find that, as a result of Northern Exposure, you get fan mail from more foot enthusiasts than you used to? BC: Not really. Well, not anymore. [Laughs.] I did for a while. I will say, though, that my daughter and I were invited to the Smithsonian Institute as a result, and they asked me if I’d get into the capsule that John Glenn went into orbit with. They wanted to take a picture of me in that thing, so I wadded myself up and got into it, and I thought they were gonna have to get a can opener to get me out. It’s a tiny little thing! [Laughs.] I was really nervous being in there. AVC: Playing an astronaut also led you to narrate the documentary Moon Shot. BC: Yeah, I think that was… [Hesitates.] I’m not sure exactly how that came about. But I was still doing Northern Exposure when they asked me to do that, so I went into a studio in Seattle and did the narration for the documentary. Also, after we showed the documentary, I met Alan Shepard and Wally Schirra and a couple of others. And after we did it, they asked me to record the audiobook for ’em, so I did that, too. BC: Oh, that’s been an absolute delight. I’ve got one more episode—it hasn’t aired yet—but Kyra [Sedgwick] is leaving the series, so they don’t have no use for me no more. So I guess I’ve gotta find other stuff to do, but it was just a pure pleasure. Frannie Sternhagen, who plays my wife, she’s just a sweetheart. She’s wonderful. AVC: IMDB—which has been known to be wrong on occasion—has you credited as playing “Co-pilot” in an episode of It Takes A Thief. AVC: It Takes A Thief was a Robert Wagner series, if that helps. BC: No, I didn’t do that one, then. I did do a Hart To Hart, but that’s the only time I ever worked with him. AVC: The next-oldest thing IMDB attributes to you is playing a character named Waldo in an episode of Movin’ On, but it says you weren’t actually credited. BC: I did do Movin’ On. I happened to be going through Atlanta, and they were casting for an episode of that. Claude Akins and Frank Converse were the leads in that, and they were casting for the world’s greatest balloon pilot. [Laughs.] And I went in and read, and they hired me to do it. That was the first time I ever met Dub Taylor, who was an old character actor. He played the guest star in the show, and he… I don’t know if you know Dub, but he had this Southern voice. I’d finished, but they hadn’t wrapped me out yet, so he comes over to me and says [Dub Taylor impression], “Did they wrap you yet?” I said, “No, they haven’t.” He said, “Go ’round behind one of them trailers there and get yourself some overtime!” [Laughs.] We got to be friends later on. He was a fine fella. And his son, Buck, is a dear friend of mine, too. AVC: You entered the Marines in your early 20s, which served you well for some of your later roles, but as far as your acting, it may surprise some people to learn that you actually started off as a Shakespearean actor. BC: Yeah, there’s a lot of us that started out doing that. Now they won’t let me do anything but these fellas that talk like me. [Laughs.] But they used to let me do a lot of other different things when I was working onstage. AVC: What brought you to acting in the first place?